Not too many years ago the thought of spending the evening in an area of town known as Canton was not something most people thought about. Not that many decades ago the area had very little to offer the masses. But oh how that has changed. For those reading this outside of the city of Baltimore and who haven’t ventured downtown for awhile, Canton is basically two miles east of downtown. It is bordered to the east by South Potomac and to the west by Linwood. O’Donnell Square is considered the center. The area has a high concentration of residential along with a very fine waterfront, the Maryland Korean War Memorial, two marinas, a boat launch and the DuBurns Soccer Arena. In other words, there are many reasons to come visit. Not the least of which are the many retail outlets and restaurants. 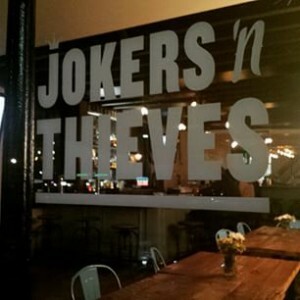 Recently I had the chance to visit one of the newer eating establishments, opened in March, Jokers n Thieves, the name inspired from a Bob Dylan song – All Along the Watchtower. It is located at 3000 O’Donnell Street, at the corner of Potomac. Currently they are open Wednesday through Sunday for lunch and dinner. Inside is quite cozy with two bars, five TV’s, and seating for about 45, but very soon upstairs will be open. Saturday a brunch is offered until 4. On Sunday brunch is available all day. 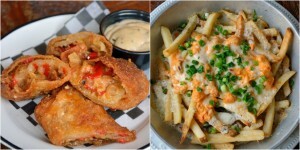 For those of you who like to know such things, a few of the brunch items include banana bread french toast, ham & cheddar waffle, fried chicken benedict and brisket & eggs. Some of the dinner items include blackened salmon, low country shrimp & grits and the fried chicken served on a Belgium waffle. That was my choice by the way. 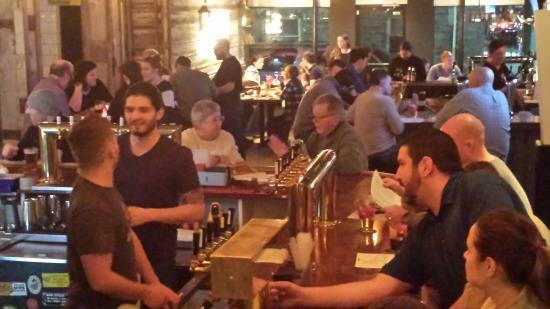 The restaurant also offers close to 30 draft beers with interesting names like DC Brau Corruption, Numero Uno, Heavy seas Loose Cannon and Victory Hop Ranch. Also offered are about six craft local cans like Union and Brewer’s Art. They are also proud of their bourbon offerings, much of it contained in their specialty cocktails. This is a locally owned restaurant, which I always think is very important to have hands on ownership. Live music is available Friday and Saturday beginning at 10. For more information call 410-675-4029 or check out the website. In conclusion, just so my knowledge of a little history wont go to waste, O’Donnell Street is named after Irish merchant John O’Donnell who settled in Baltimore in 1785 and began trading with merchants in the Chinese port of Guangzhou, then called Canton by English speaking people.